The length of time it would take to sell every home that is currently available for sale, as long as no one else puts their home up for sale. Why is it important? It is ONE of the ways we determine how healthy (or not) the real estate market is. It’s a tool for knowing how we should price your home in order to get it sold in today’s real estate market. 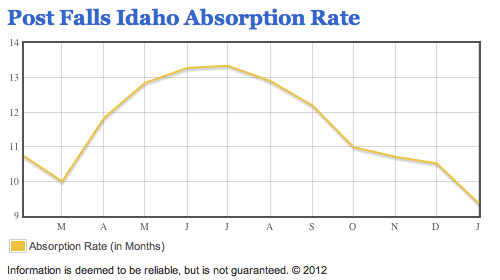 I was looking at Post Falls homes – checking out what their “absorption rate” currently was. Needless to say, I was VERY happy to see that with January’s closings tracked, the absorption rate for Post Falls dropped to 9.5 months for the first time in YEARS. Post Falls is UNDER 10 months. That’s great! That’s lower than at any point in 2011. We are progressing more and more into a healthy, balanced market. It’s been a long time coming. I’m ready, how about you?